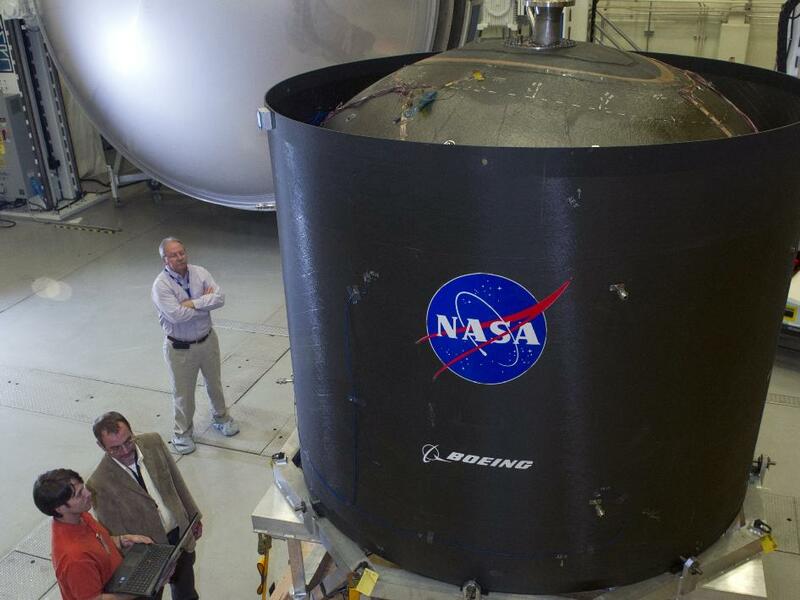 A 2.4-meter-diameter propellant tank made of composite materials arrived on Nov. 20, 2012 at NASA’s Marshall Space Flight Center in Huntsville, Ala., where engineers are preparing it for testing. Composite tanks have the potential to significantly reduce the cost and weight for heavy-lift launch vehicles and for other future in-space missions. The tank’s arrival marks a significant milestone that was made possible because of contributions made over the last year by multiple NASA centers and The Boeing Company, the prime contractor for the project. This is the largest composite tank ever produced with new materials that do not require autoclave processing. Autoclaves for processing large composite structures are complex, high-pressure furnaces. Boeing used a novel automated fiber placement technique to manufacture the tank in Tukwila, Washington. The tank is a major element of the Composite Cryotank Technologies and Demonstration Project — one of the top nine projects in NASA Space Technology’s Game Changing Development Program. Marshall is leading the project with support from NASA’s Glenn Research Center in Cleveland; NASA’s Langley Research Center in Hampton, Va.; and NASA’s Kennedy Space Center in Florida. Over the next two months, the tank will undergo a series of hydrogen pressure tests in Marshall’s test facility where engineers will measure its ability to contain liquid hydrogen at extremely cold, or cryogenic, temperatures. NASA and Boeing engineers will use the test results to refine the tank design and build a larger 5.5-meter composite tank scheduled for testing in early 2014. The design features and manufacturing processes can be applied to propellant tanks similar in size to tanks needed for heavy-lift rockets. Large propellant tanks for the Space Shuttle and other vehicles have typically been made of aluminum.